Well. I have to say goodbye to Ipsy. As we all know, I signed back up for the subscription in June. I figured I would give them July as well, even though I should have known that it just wasn't going to work out. I waited and waited and waited to get a tracking code. After commenting on another post on their facebook page (also complaining about the tracking code) it mysteriously popped up in my inbox. Then I checked it everyday, and it didn't move once in 10 days. It sat in NC for 10 days. I wasn't impressed. I cancelled for August, and asked why my bag was just sitting in once place for so long. They emailed me back telling me they would send a second bag free of charge and to keep both. That's okay, but I knew I wasn't getting anything good. Why would I want doubles. My first bag ended up moving a day or two after that. This was my first bag. 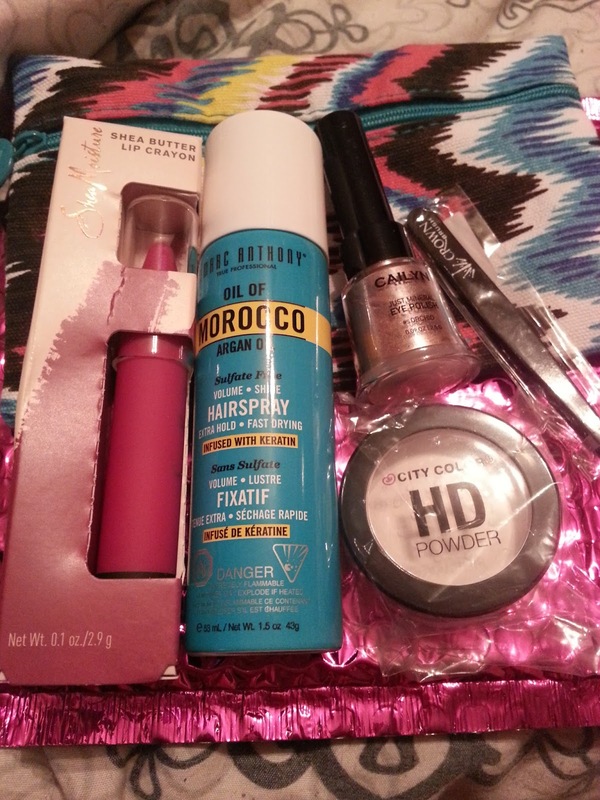 Not pictured is the lip crayon I redeemed with some points, but it will be in my second bag photo. Crown Brush - Professional Tweezers - yay pink! But they are just tweezers. I have a decent pair and these aren't that good. I'll keep them around though and use them for other things besides my brows. Jelly Pong Pong Cosmetics - 2 in 1 Shadow/Liner in a dark brown shade. I haven't tried this, I don't think I will open it either. I have a million liners and this is a little dark for me as a shadow. Plus it's a pencil and I'm not a fan of pencils. Coolway - Beachy Salt Spray - I haven't opened this either because I have some other beach salt sprays open. I also don't use them often so I'm not in a rush to open this. It's a very small sample. Jersey Shore Cosmetics - Mongongo Vanilla Coconut Cream Lip Conditioner - let's call it what it is. Lip balm. It smells good, and it is creamy. I'll be keeping it just because I love lip balm. But again, I have a zillion to get through. City Color Cosmetics - HD Powder - I've heard good things about this. I have a bunch of powders open. Not in a rush to try this. As you can see. It was a pretty meh bag. And from the reviews I've been seeing online, not that many people were happy with their bags either. Here's the replacement bag. Shea Moisture Shea Butter Lip Crayon in the shade Sarah - This is a bright pink with a little bit of a purple-ish undertone. I like it applied lightly. I'll be keeping the one I got in the first bag since I've swatched it, but I will getting rid of the second one. Marc Anthony Oil of Morocco Argan Oil Hairspray - I got this in a bag a few months ago, and I definitely didn't need it as a repeat. It's still full, so off it goes. Cailyn - Just Mineral Eye Polish - in Orchid - again, another repeat from the past bag. I didn't like it in the first one and I don't like it in this one either. 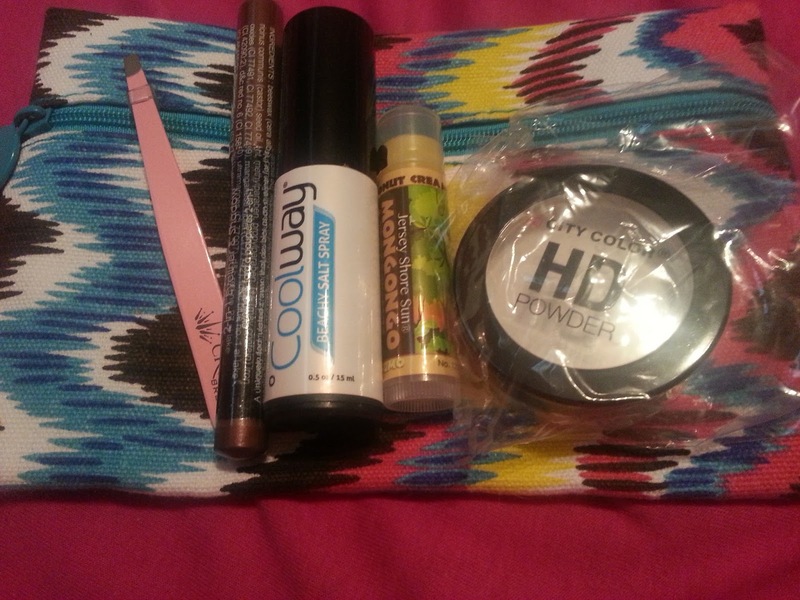 City Color Cosmetics - HD Powder - repeat from the bag I just got. Crown Brush - Professional Tweezer - black this time. If they were good I would keep them both, but they're not. So this whole bag is being passed on. I may even include some other products from past bags that I don't want just to entice someone else to buy it. I don't want it sitting around because I don't need doubles of any of these products. Ipsy and I are officially broken up forever. I saw that Tarte and Too Faced in August's spoiler, but I won't fall for it. I won't fall for your double points or no wait list either. We are through. You were good in the beginning but as time went on you let me down.